There are three crows out back chasing a fourth crow that was lucky enough to have found an old hamburger bun in someone’s garbage. Crow #4 has the bun in his beak and is swooping around the bare branches of the red maples trying to find a quiet spot where he can tear the bun up and eat it. 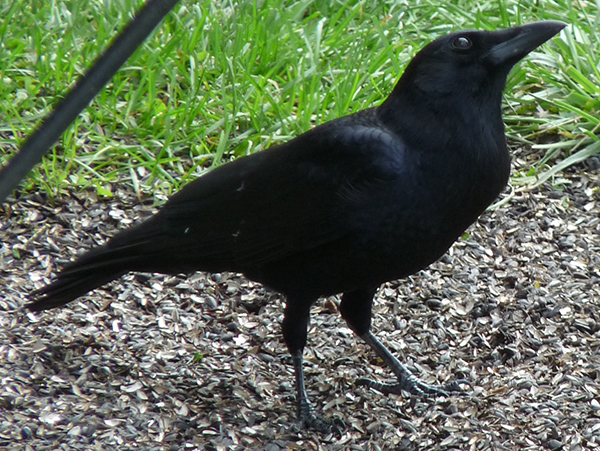 The other three crows have different ideas and are trying to harass Crow #4 so that he drops his prize. Then #1 or #2 or #3 will become the target of harassment. Somebody is going to get some tasty stale bread for breakfast, but it is not clear after fifteen minutes of watching exactly whom that will be! Crows form small foraging groups in the winter and, probably, fuss greatly over any large food find. They are sure are wasting a lot of energy, though. 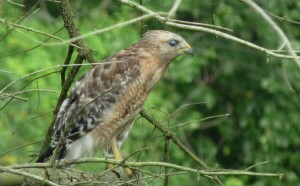 Good thing they are stuffed full of the peanuts and shelled corn from my bird feeders! Even though it’s early December, there are still robins digging around in the yard. They are particularly interested in the leaf piles I have raked up (yes, I finally got around to doing that job!). The Cornell Laboratory of Ornithology just published an article recommending that you do not rake up your yard leaves! The leaf cover is the home for so many insects and edible invertebrates that removing them functionally makes your yard into a food desert for many species of birds! Leave the leaves where they fall: less work for you and more “green” impacts on your yard ecosystem ! Sounds like a great idea. I just watched a robin scuff away a cloud of dry leaves and grab onto a long, pale earthworm that had been hiding beneath them. Great breakfast! The juncos (those wonderful “snow birds” that have been steadily increasing in numbers over the past few weeks) are bustling around on the leaf pile edges along with the white throated sparrows and cardinals. I can’t tell from this distance what food they are finding, but they all seem intent on their search processes. The two Carolina wrens that rule my yard (or think they do, anyway) are darting between various tree perches and the wood pile. They refuel at the feeders along with all of those ground gleaners, so their search for “natural” food doesn’t seem too frantic. The chickadees, titmice and downy woodpeckers have joined together to make a large, complex flock. At first glance this flocking behavior would seem to be disadvantageous to all of the species and to all of the individuals concerned. Food is in short supply in the winter even with the extra rations at the bird feeders, so how could the clustering of many individuals that all eat approximately the same natural prey items (primarily insect larvae) do anything but decrease the survival of respective species? The answer involves the facilitation of food finding and the reduction in the average individual’s energy devoted to searching for food. In the large mixed flock there is a very high probability that some flock member will find a food source (a cache of larvae under some tree bark for example). The exploitation food sources by the entire flock with the subsequent high probability that another individual will find another food cache “smooths out” the expected boom and bust food cycle of the winter system, thus increasing the survival of a higher percentage of individuals in the mixed flock. Further, from the perspective of the downy woodpecker, flocking with the very alert and excitable chickadees and titmice also increases their awareness of incoming predators and thus adds to their chances of winter survival. Crows could learn a lot about cooperation from these smaller birds! 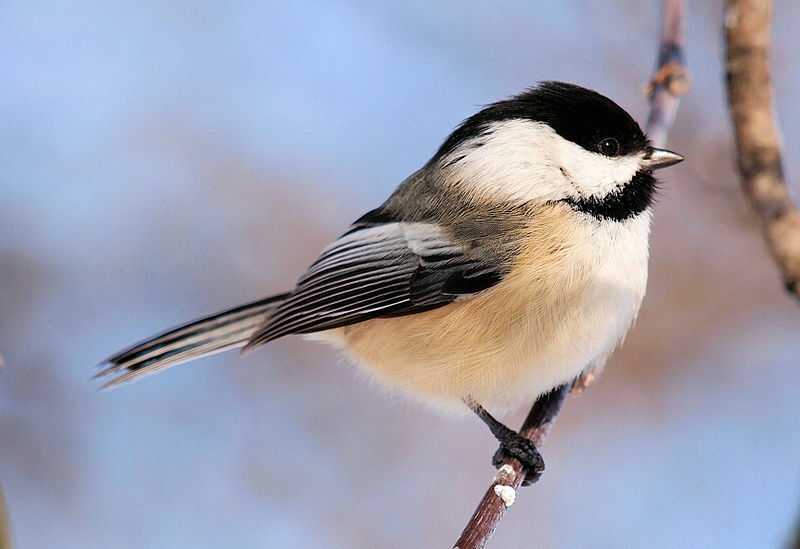 Another interesting behavior that was described by Aldo Leopold (author of the “Sand County Almanac”) is the positive response of chickadees to loud, explosive noises (like shot gun blasts or tree limb breaks). The chickadees swarm toward the sound very energetically (and in a mixed flock carry along the titmice and downy woodpeckers with them). The breaking of a tree limb or the falling of a tree opens up woody encasements that may be densely inhabited by ants, ant larvae and/or other insect larvae. Drawn to the loud noises, the birds can rapidly exploit a suddenly available food source. Speaking of predators, not only has the great horned owl been lurking about but the sharp-shinned hawks (a male and a female) have also been regularly swooping across the feeder area of the front yard. There have been several piles of bloody feathers (mourning doves and cardinals, primarily) around the edge of the field, too. As I have written before, the predators keep the prey populations alert and active. Also, every species needs to eat to survive! 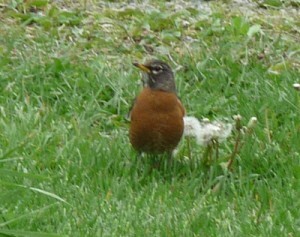 There are still bluebirds around, too. A small percentage of the spring and summer bluebirds stay around all winter. They shift the focus of their omnivorous diet away from insects over to fruit and survive by feeding on the dried wild grapes on the vines high up in the forest canopy, holly berries, crabapples, and even the fruit of poison ivy. We will be watching the bluebirds of Harrison Hills Park this winter to try to get an idea of what percentage of the local population avoids the energy stresses of migration and what proportions of males and females stick around. 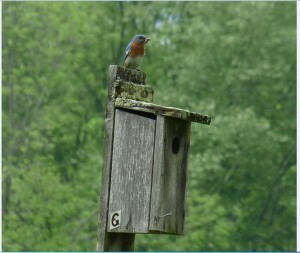 Last month we watched three male bluebirds actively checking out a bluebird house we had just put up in the park. They probably winter nest in groups. We’ll try to measure the sizes and gender proportions of these communal clusters! 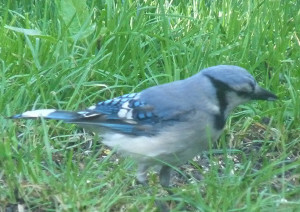 The kings of winter survival, though, have to be the blue jays. They feed all day at my bird feeders taking the peanuts early in the morning, shelled corn as long as it lasts, and then black oil sunflower seeds all the rest of the day. They are out in sub-zero weather, rain storms, sleet storms and snow storms. I have watched them stare down gray squirrels and even deer in order to keep possession of a full feeder! They usually come to the feeders singularly or in groups of two or three, but they are there from early dawn until just after sunset. Only the crows are able to regularly chase them off! Your opening paragraph appears to be an apt metaphor for the Republican primary.